German Aircraft of WWII: Bf 110 in the Med. Bf 110 in the Med. The Messerschmitt Bf 110C and Es were committed to the invasions of Yugoslavia and Greece in April 1941. I and II./ZG 26 were deployed to the theatre. Once again, the Bf 110 encountered foreign flown Messerschmitt Bf 109s, this time belonging to the Yugoslavian Air Force. As over Switzerland in 1940, the battles ended in their opponent's favor. On the first day, 6 April, Bf 110s of I./ZG 26 lost five of their number in exchange for two Yugoslavian Bf 109s. II./ZG dispatched several Hawker Furys, but managed to lose two of their own against the biplanes. Over Greece, on 20 April, II./ZG 26 claimed five Hurricanes of No. 33 and No. 80 Squadron RAF for two losses. This engagement saw the death of 50-victory ace Marmaduke Pattle of No 33 Squadron. Staffelkapitän Hauptmann Theodor Rossiwall and Oberleutnant Sophus Baagoe were amongst the claimers on this day, taking their scores to 12 and 14. Also killed in this battle was the ace F/Lt W.J. "Timber" Woods of No. 80 Squadron with 6½ kills. Oberleutnant Baagoe was killed on 14 May 1941 whilst on a strafing mission during the Battle of Crete. The British defences and a Gloster Gladiator pilot claimed credit. Around 12 Bf 110s were lost over Crete. The Rashid Ali Rebellion and resulting Anglo-Iraqi War saw the Luftwaffe commit 12 of 4./ZG 76's Bf 110s to the Iraqi Nationalist cause as part of "Flyer Command Iraq" (Fliegerführer Irak). The German machines reached Iraq in the first week of May 1941. The campaign in the desert would last for ten days. Two RAF Gladiators were claimed by future night fighter ace Martin Drewes. But RAF raids badly damaged two Bf 110s. However, by the 26 May, no Bf 110s were left serviceable and German personnel were evacuated. One Bf 110 (Wk-Nr 4035) was captured by the RAF and test flown as RAF serial HK846, "Belle of Berlin". Based in Cairo, Egypt, it was to deploy to South Africa as part of a program to train pilots on enemy equipment. It did not make it, crashing in the Sudan. 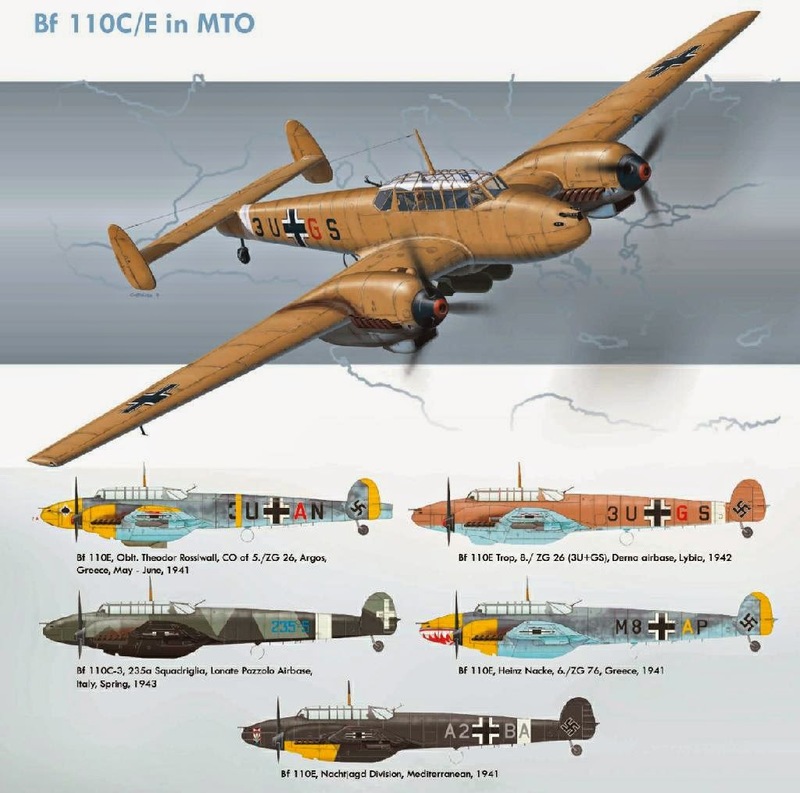 In the North African Campaign, the Bf 110 acted as a support aircraft for the Junkers Ju 87 Stuka units. In 1941, nearly 20% of the Zerstörergeschwader's missions were ground attack orientated. A number of Bf 110 aces were lost in aerial combat during this period, and other losses were considerable. Significantly, on the night of 22–23 May, the Bf 110 was pressed into night fighting service over the desert. Oberleutnant Alfred Wehmeyer scored three nocturnal kills against Allied bombers in the space of a week. In August 1942, a stalemate between the Allied and Axis forces in North Africa permitted the withdrawal of III./ZG 26 to Crete for convoy protection. During this time, a number of United States Army Air Force B-24 Liberators were destroyed. On 29 September 1942, whilst on patrol alone, Oberleutnant Helmut Haugk of ZG 26 engaged a formation of 11 B-24s, dispatching two of the bombers. The Bf 110 had demonstrated its capability in a role it was to excel in over Europe. Lastly, in February 1945, two Bf 110G-4s were supplied to the Air Force of the Independent State of Croatia (ZNDH). One was destroyed by Allied bombing at Zagreb and the other survived and sought sanctuary at Klagenfurt in Austria with other retreating ZNDH aircraft in May 1945.